Its two days until installation of my solo show at Bureau, Blackburn. Experience has taught me to make perfumes at least 3 weeks prior to an opening as this gives fragrances time to go through a maturing process and settle before the exhibition begins. As such, the fragrances are complete. But, unsatisfied with merely providing perfumes, I spend today completing all visual material for the show. 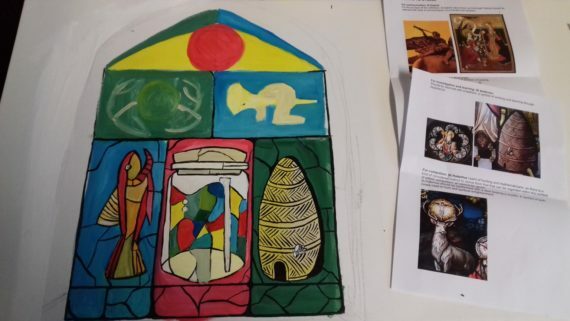 This comprises of 4 paintings representing 4 saints, and one painting that seeks to describe the show as a whole. I get to my studio at midday and leave at 7pm, having completed all the work to my satisfaction. The main body of the work for my show is done. Feverishly, I start occupying my mind with the little things, like what colour paper to use for wall text, the font of my wall text and where the wall text should be placed. While important it hardly warranted the attention I gave it. It’s like I don’t know how to stop. This is the day of installing Perfume as Practice at Bureau, Blackburn. Travelling from Sheffield via Leeds on the train with bags of perfume, shelving, tools and paintings at first felt like a daunting prospect. But, with the help of fellow artist Sharon Mossbeck, the journey went smoothly. 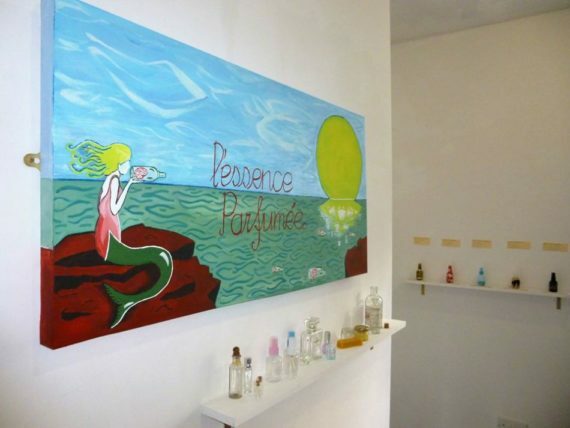 The install essentially entailed the installation of 4 shelves, 5 paintings and a few other embellishments, before placing 15 perfumes on the shelves. It was relatively straightforward to be honest. I stay in Blackburn for the night as the opening evening is tomorrow. 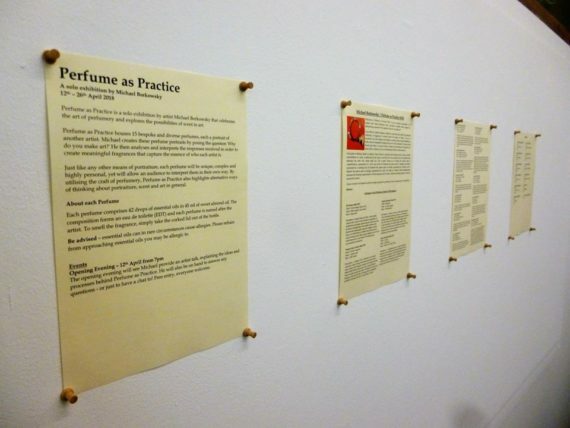 Thursday was the Opening Evening of Perfume as Practice. Beforehand Sharon and I took the chance to visit Samlesbury Hall nearby: After all, one of the accidentally great things about being an artist is the opportunity to visit places you may not get a chance to go to otherwise. The opening seemed to go down well. As ever, attendees were struck by the innovative nature of perfume as a vehicle for portraiture, and appreciated the interactive element of actually being able to smell the perfumes. 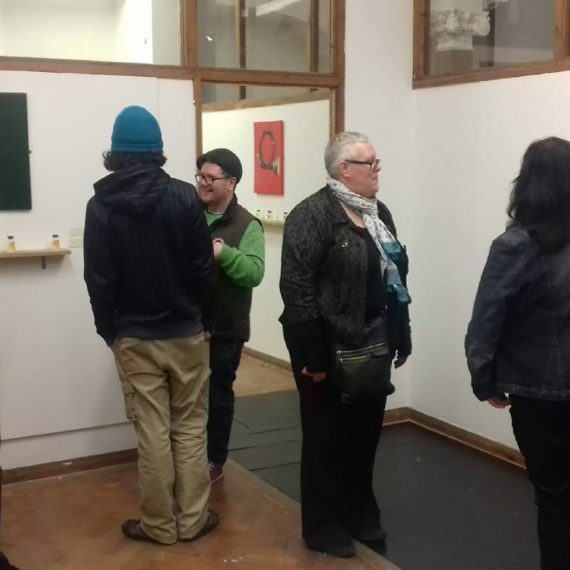 I also held an artist’s talk during the opening, which helped consolidate the themes, ideas and desires found within the making of the exhibition. I travel back from Blackburn to Sheffield after the opening. Today was the installation and opening of Sharon Mossbeck’s solo show at BasementArtsProject in Leeds. As a means to return the favour from Blackburn, I helped transport her work from Sheffield to Leeds, and I was with her for the opening event. Her exhibition is called ‘Forgotten Spaces’ and charts medieval dungeons by utilising cross stitch. It looks fantastic, and rather harrowing. 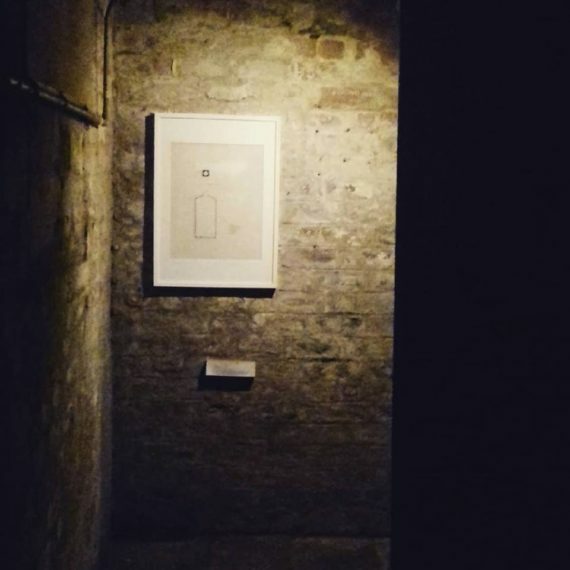 Credit too should go to BasementArtProject’s Bruce Davies, who designed the curation of the show in a deliberately dark and claustrophobic way. I travel back from Leeds to Sheffield after the opening. 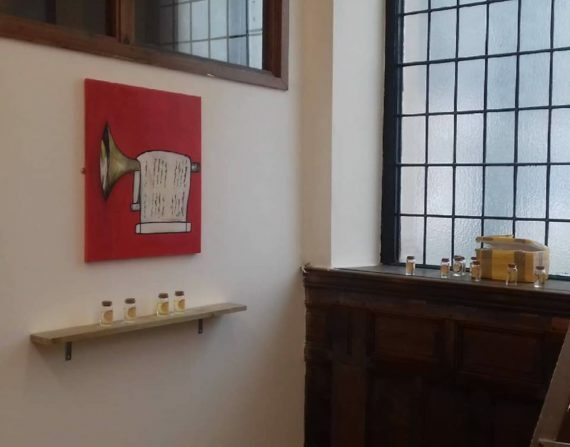 Today I hold a perfume making workshop at Bureau, Blackburn to coincide with my exhibition. I am pretty well versed in delivering these workshops by now and as expected it runs smoothly. 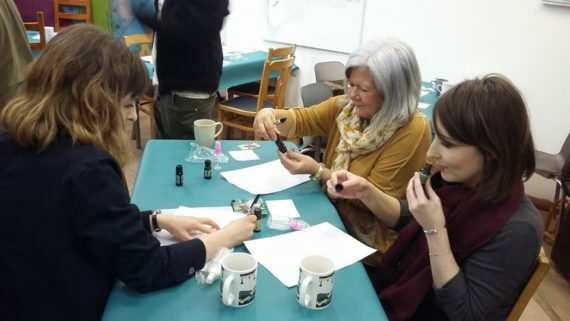 As ever, the experience of exchanging knowledge and introducing attendees to the artistic capabilities of perfumery is rewarding in its own right. I travel back to Sheffield from Blackburn after the workshop. I placed the candle on social media a few weeks prior, and it seems to have established an audience that would like to purchase one. 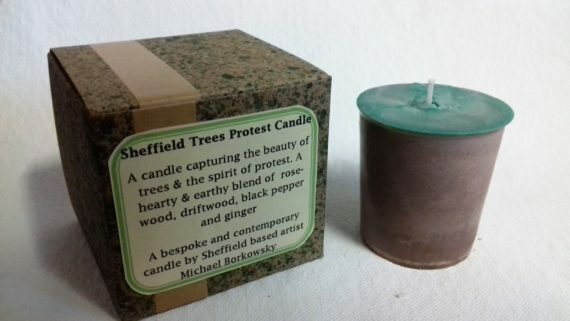 As such, I spent Sunday travelling around Sheffield physically delivering candles to those who want one. It took a while, but it was a happy excursion, for sure. Perfume as Practice is up. Forgotten Spaces is up. My perfume making workshop is done. I have delivered all my candle orders so far. So what next? Well let’s have a look at my emails for a start to see what I have neglected over the last week. Then let’s look at documenting and promoting Perfume as Practice on my various social media outlets. Then let’s maybe start thinking about my upcoming group show in Athens. Then let’s perhaps look at getting more venues for Perfume as Practice next year; and Scents of our Time. The list, as ever, goes on. 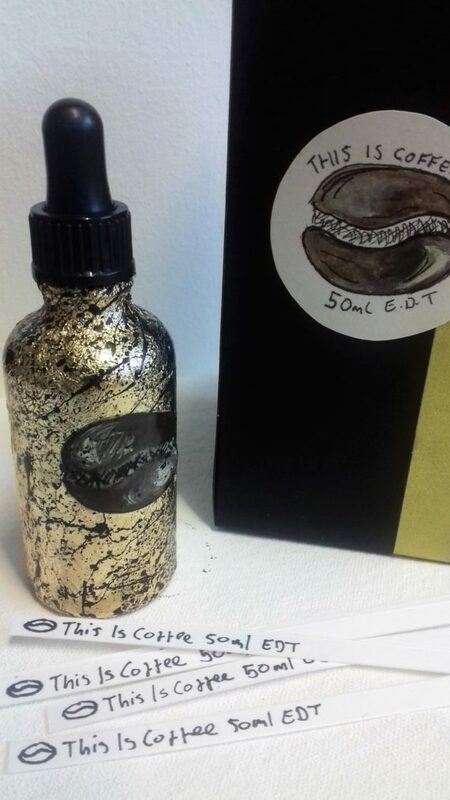 ‘This is Coffee 50ml EDT’ – to give it it’s full title – is the most overt showcasing of perfume as an art form I have yet made in my position as a fine art perfumer. For one, it’s visual livery is bespoke and of a higher standard than usual; it playfully impersonates a high-end supermarket coffee brand – utilising watercolour, paper and gold leaf to feign the appearance of a luxurious yet affordable product. The scent itself, though, is at odds with such visual embellishments. As a fine art perfumer, I seek to develop ways of using scent to instigate social, political and environmental comment. As such it is not only the aroma of coffee that takes precedence within the fragrance composition. This fragrance comprises 3 other fragrance notes that allude to the various social, economic and environmental factors associated with coffee and coffee production: Brazilian Rosewood oil, while ethically sourced, is nevertheless from a tree loaded with implications of sustainability that run parallel to coffee production. The Orange oil also derives from Brazil, and as such references the rich history Brazil has with coffee production. Hazelnut is also present, which references the versatility coffee has both as a product and ingredient. Furthermore and from the context of perfumery, the scent of coffee beans is said to cleanse the nose in preparation for assessing aromatic compounds; it is a tool that allows a perfumer to devise scent combinations with more accuracy. ‘This is Coffee’ shuns the established, clinical use of coffee beans within perfumery and instead places coffee at the very heart of the fragrance composition. Again this removes perfumery from it’s conventions and seeks to place it in a subversive, contemporary art platform. Phew! So, that was ‘This is Coffee’. Now, what does this mean for my wider creative output? Well, simply put, this is to act as a template for the three planet-based perfumes I am going to produce for Athens next month. ‘This is Coffee’ is a piece of preliminary work that establishes the fact that simply making a bespoke perfume with a meaningful artistic fragrance composition and competent visual livery makes for an engaging scented experience. I feel over recent months I have been thinking a little too hard about how the ‘scented experience’ should act upon the viewer. Stripping my practice down the essentials of bespoke perfume, in a box and embellished accordingly, highlights with precision how the craft of perfume can accommodate meaning beyond it’s preconceptions. I’m looking forward to bottling Uranus, Jupiter and Saturn in a similar manner over the coming weeks.